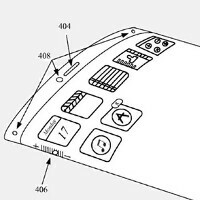 Apple has been awarded a patent for an application it filed in 2013 for a curved screen. The interesting thing is that Apple's patent not only covers a curved display like the Samsung Galaxy S6 edge, it also covers the ability to make the screen flexible. With such a display, Apple's screen could show more content than a competitor's screen, without having to increase its size. For example, Apple could fold the screen in a way that video or still images would appear to look as though they were coming from a continuous loop. With the patent, Apple could make the iPhone a cylinder, a sphere, or whatever shape tickles Jony Ive's fancy. In theory Apple could develop an iPhone made entirely of glass that could replace certain buttons with 3D Touch. Additionally, by making the screen flexible, Apple could put a second screen behind a first one in a manner that would create 3D images. We've seen 3D images and photography offered on smartphones before, like on the HTC EVO 3D and the LG Thrill 4G, but those phones used a different stereoscopic technique. Apple also received a patent for a gesture based system to enter specific passcodes in conjunction with Touch ID. Unlike Android's gesture based passcode method, in which the specific dots tapped matter, Apple's system depends on how a specific dot is tapped. For example, when touching the bottom dot, does the iOS user wrap around the middle dot a specific number of times, or does he drop straight down to the bottom dot? In Apple's patented system, this choice matters and adds many more potential passcode possibilities, making it harder for someone to figure out a passcode and break into an iPhone. The 6/6S have very slightly curved screens. They're nowhere near as pronounced as the s6, nor is there any function, but they do actually curve. That's called 2.5d glass. Nothing remotely special about it, as a lot of smartphone have it. Actually, I even have it on my tempered glass screen protector. 2.5d glass is such a gimmick, does nothing except stop you from applying a tempered glass protector on flush. All those YouTube videos with that curved display design are coming to life. A curved display glass is nothing special we had this for years, since the Galaxy Nexus, but a curved display screen is something else and started with the Galaxy Round and LG Flex. The curve on iPhone's screen is just how they cut the protection glass. The actual screen is flat. It has no function but just the look. Fairly sure, as others have pointed out, that it's just the glass on the outside that's curved, the screen is entirely flat. I did not say it IS something new. But why bring it up? People were talking about bendgate like last year. You need to update your head, oh no you are an Android lover so you need to wait a lot to receive an update!!!!!! Apple does not deserve these patents. First one should go to Samsung and the second one should go to Google. I thought LG had the first patent for a curved screen, they certainly had the first phone with one. There are lots of ways to curve a screen. Right? The patent has to be for a different way seeing as LG and Samsung offered a different approach. Amazing how the curved screen which is mostly for asthetics, which the iPhone was worshipped for, for years is considered a gimmicks and owner Apple may do similar one day and now people are getting excited. Hypocrisy is a iFanboi number one trait. Actually, no they didn't. The first phone with a curved screen was the Samsung Galaxy round. The LG G flex came after that. Dude, these patents were submitted 2-3 years ago. I actually remember when they were filed. People initially thought it was going to be the iPhone 6. A lot of people dismissed it due to the screen on the side. People assumed you would constantly hit the buttons while holding the phone. Fast forward to 2015 and we have 3D Touch. in fact, this is where all the fake iPhones on The Internet with wrap around screens came from. You know it's old because it has the old connector. Something is up because of the timing this got approved. App,e must have pushed for it. Similar timing happened with Touch ID. Also, with the rumored new material, this could get interesting! So true there papasmurf Apple has failed since Steve jobs passed!! Apple needs to keep there greedy hands off!! Like always they copy android and the fanboys love it!! Heck just go android already but they have no brains they love to show that stupid shiny logo on the back LMAO!! Why? If Apple started to work on these things earlier than Samsung, they deserve the patents. Samsung brought it earlier to market though. Yes. US patents getting more crap. Every company who want to get patent must show the prototype before approved, not only with design, idea, and sketch patent can be approved. I believe Apple does not have the prototype when it registered. If I have fortune teller who can see the future's trend, I want to patented those easily. This is cool. I can't wait to see an iPhone with a curved screen. Hopefully, more companies start to develop curved/flexible screens.